What sets Artisanal Premium Cheese apart is the art of affinage -- an ancient practice by which passionate cheese professionals complete the cheese maker's labor of love, patiently nurturing each cheese to optimal ripeness and peak flavor. Founded by Chef Terrance Brennan, who revolutionized cheese appreciation in the United States at his New York City restaurants Picholine and Artisanal Fromagerie & Bistro, Artisanal Premium Cheese makes the world's finest cheeses available nationwide as never before. The gift certificate may be used online at ArtisanalCheese.com towards the purchase of any of their products, including cheeses, cheese gift baskets, and cheese accessories. Residents of and visitors to the New York area can even use it to purchase tickets to cheese classes and tastings. 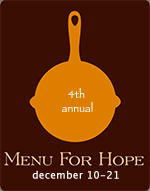 For a list of all the prizes in the Northeast U.S., visit the Menu for Hope page at Serious Eats. For other regions, see Chez Pim.